With a stay at Mercure Wellington Central City Hotel and Apartments, you'll be centrally located in Wellington, steps from Cuba Street Mall and Bucket Fountain. This 4-star property is within close proximity of The Opera House and Wellington Town Hall. Make yourself at home in one of the 54 guestrooms featuring refrigerators and microwaves. LCD televisions with satellite programming provide entertainment, while complimentary wireless Internet access keeps you connected. Bathrooms have showers and hair dryers. Conveniences include phones, as well as desks and coffee/tea makers. 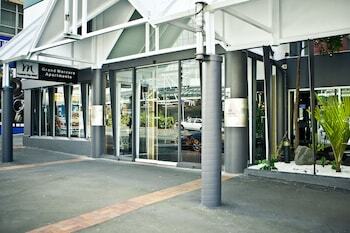 Grand Mercure Wellington Central City Apartments is an ideal Wellington lodging choice for your trip to New Zealand. With numerous amenities for guests such as dry cleaning service, laundry, non-smoking facility, you will wake up at Grand Mercure Wellington Central City Apartments feeling excited every day for your time in Wellington. Don’t let this amazing reservation opportunity pass you by, book your stay at Grand Mercure Wellington Central City Apartments today to make the most of your time in Wellington, New Zealand.